The relationships marketers have with different channels are similar to the relationships people have with different types of friends. Social media, for example, is the new and cool bestie that marketers look forward to partying with and introducing to all of their other friends. Mobile on the other hand, is like a hipster friend that can be difficult to meet up with, yet always provides interesting and valuable experiences. Then there is email, which is a marketer’s most loyal and trusted confidant. Sometimes it can be awkward to introduce your friends to one another, but this is not the case with email and mobile. In fact, emails should be optimized for mobile devices, and marketers who haven’t adopted responsive design for their campaigns are missing out on big revenue opportunities. According to Listrak’s “2014 Research Report and Look Book,” more than half of all emails are opened on mobile devices and $1 of every $10 spent on e-commerce comes from a mobile device. Yet Listrak’s data on top retailers’ email marketing strategies reveals that just 6.4 percent are using responsive design for their campaigns. Fortunately, leveraging responsive design for email campaigns is becoming a much easier task, as a variety of email marketing service providers have added responsive templates to their offerings. 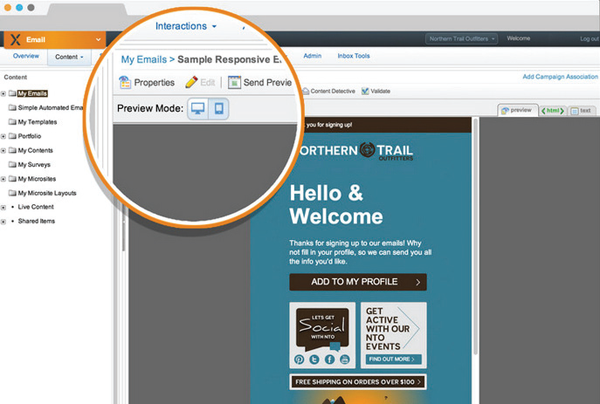 The ExactTarget Marketing Cloud, for instance, offers mobile-optimized email templates that enable marketers to preview messages on both mobile devices and desktops with real-time rendering tools (see image below). The ExactTarget Marketing Cloud enables users to preview emails on both mobile devices and desktops. While delivering messages that display correctly on all screen sizes is important, marketers can also improve their campaigns by adding a personal touch. Email empowers marketers to establish an ongoing relationship with their customers, and the best relationships are those that go beyond the surface. For marketers, this means delivering content personalized to their recipients. In fact, research from Salesforce’s “Predictive Intelligence Benchmark” report reveals that 60 percent of shoppers who received personalized content after abandoning their shopping carts ultimately returned to make a purchase. This presents a huge opportunity for retailers to remarket to consumers, especially since Listrak found that 74 percent of online sales are abandoned before a customer completes a transaction. Fortunately, there are many solutions available that can help marketers recover information from consumers who abandon their shopping carts. Up- Sellit (a company Website Magazine has been covering for 10 years - read more at wsm.co/tbtupsellit), for example, offers email remarketing solutions that help marketers collect more leads. With the company’s PreCapture feature, businesses can obtain email addresses from consumers who fi lled out a form but abandoned it before advancing to the next page. Conversely, the company’s ExitCapture feature collects new leads at the moment of site abandonment. Marketers can then engage these visitors with targeted incentives that require an email address to redeem. Once the address is collected, the visitor is immediately sent a message containing an incentive. When it comes to incentives, however, it is important for marketers to remember that they don’t always need to send a discount in their first recovery message. Incentives make it easy for marketers to close a sale and strengthen their relationship with consumers and are used frequently in remarketing campaigns to motivate consumers to revisit their abandoned carts and complete their purchases. Marketers should keep in mind, however, that shoppers abandon their carts for a variety of reasons, and a discount isn’t always required to get consumers to convert. In fact, Listrak’s data shows that top retailers decreased the number of discounts being offered in their first remarketing message in 2014. Take BarkBox as an example. This pet supply subscription service sent a recovery email the same day a prospective subscriber abandoned her checkout on the company’s website. The first message from Bark- Box simply asked the pet owner to come back and complete the order. When the user didn’t take action, BarkBox followed up the next day with a second message, which offered a 10 percent discount if she completed her order within 48 hours. After that deadline passed, the service provider tried one last attempt at conversion with a message offering an extra free box with any subscription plan. BarkBox used a three-message recovery campaign to close the sale. This three-message recovery campaign works because it initially tries to win consumers with just a friendly reminder – what if the consumer got distracted and had to leave the computer for some reason? Then, the second and third messages try to win the consumer with incentives. Keep in mind that the consumer could have abandoned her cart to research other pet supply subscription services, and these email incentives could be the motivation a consumer needs to choose BarkBox over a competitor. It is important that marketers don’t become too complacent with their email strategies. Even though email is a longtime friend, that doesn’t mean it’s not still evolving with new technologies and trends. Marketers who want to use this marketing channel to their advantage must keep up with these changes and optimize their own initiatives accordingly. After all, relationships – even old ones – require upkeep.